Saturday was a huge day for Everton Football Club and one that carried huge significance both on and off the field. It’s easy to over state the importance of early season form – and the second game of the season is no place to judge the prospects ahead – but this felt like a real watershed moment for all things Royal Blue. Fan frustration with boardroom negligence/incompetence had reached a crescendo, resulting in a form of protest – not seen since the club was faced with the Kirkby debacle. What’s more that perceived leather seat lethargy had crept on to the field of play in the second season of Roberto Martinez’s tenure and showed few signs of being eradicated during an opening day 2-2 draw with newly promoted Watford. What transpired was perhaps the most accomplished Everton away performance in recent memory – certainly in the Spaniard’s reign – to sweep aside Southampton by three clear goals. A timely reminder of just what this Everton side is capable of when they play with desire and purpose to both their attacking and defensive play. Such a result would have been beyond the imagination of most of the travelling faithful – regardless of a starting line-up which included the much maligned Arouna Kone operating from the right of a front three and youngster Brendan Galloway, who struggled in difficult circumstances against Watford. However, this was a purposeful Everton, typified in the 6th minute by a rampaging run from Romelu Lukaku down the Southampton left, resulting in a foul from the young left back Matt Targett, correctly adjudged by referee Michael Oliver to be outside of the penalty area. It set the tone, this was an Everton side that had been setup to pressure the opposition with a real intensity when out of possession, coupled with a real aggression and positivity on the break to take full advantage of strengths that have been neglected for long enough. In the 22nd minute those strengths were in full view, when a lose ball was latched on to by Barkley, who when joined by a wave of olive shirts released Arouna Kone down the right hand side. The Ivory Coast international remained composed and clipped a delicious perfectly timed right footed cross to the back post for Lukaku to guide a precise header in off the underside of the bar to send the away fans into rapture. It wasn’t any more than Everton had deserved, a few misplaced passes in their own third and a decent Tim Howard save from Sadio Mane aside they looked comfortable. Soon after the goal Everton went onto the front foot once more, this time Lukaku the unintentional provider, turning well to evade his marker and inadvertently slide in Barkley. The young England intentional shot tamely, directly at Stekelenberg who watched on as Cleverley stabbed the follow up wide. Everton looked a real threat with the inclusion of Kone off the flank, who linked up superbly with Lukaku, providing a real focal point for Everton to begin their attacks, where the Belgian might have looked isolated in the past. 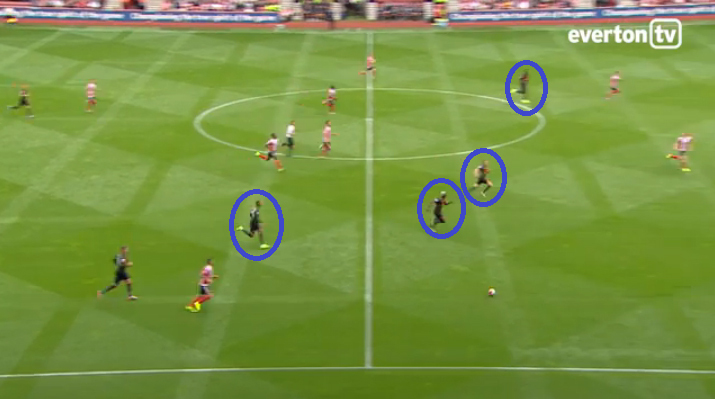 As a result, the forward play was direct when required and stretched the game for Barkley who had began to enjoy himself, controlling the game from the extra space provided. Never was this more evident when Lukaku once more diligently won back possession on halfway, releasing Barkley who drove directly at the back four, choosing the perfect moment to slide in the powerful number 10, who swept home left footed for his second of the game. Tactically, Southampton needed and change and brought on former Chelsea midfielder Oriel Romeu for the disappointing Dusan Tadic, who found it difficult to impress his abilities on the game in the face of the tireless Tom Cleverley down Everton’s left hand side. For a short period the change paid dividends as Southampton dominated possession in the early stages of the second half without any significant penetration. Their best opportunity coming when Seamus Coleman failed to deal with a teasing cross, chesting the ball into the path of Graziano Pelle to volley straight at Howard who claimed gratefully. It was as good as it got for Southampton, who found it difficult to create chances against a resolute defensive unit, which showed little signs of being breached. It was Everton who had the final say, when Coleman played a neat one two with the unplayable Lukaku and finding Ross Barkley in space on the left side of the penalty area. Barkley opened up the target superbly with the outside of his right foot and whipped one beyond the despairing dive of the Dutch goalkeeper to seal the victory and cap a brilliant personal performance to reaffirm just what a star he is going to be. This was a really impressive performance from Everton and one in which it would be difficult to single out any individual player for special attention. It was an excellent team performance, punctuated by the attitude of the players and the mentality from the first whistle. The word direct is misused and can be misunderstood, it is best replaced with purpose and that is what the watching thousands desired and duly received from Everton at St Mary’s on Saturday. That added work rate and intensity opened up the game in advanced areas and allowed the intricate passing to be effectual and allow the players to reap the rewards. The acid test will always be, what happens when a team sits on the edge of the box and invites pressure, can Everton maintain that intensity or do they possess that desired craft to break them down? Only time will tell and one swallow doesn’t make summer as I was told soon after, but it was a good start and it couldn’t have come at a better time.